The early national elections, held in April together with provincial and local elections, took place in a calm atmosphere. The recommendations of international observers need to be followed up, including those on ensuring that campaign financing and the registration process are transparent. The new government programme included Serbia’s EU accession as a priority goal. Involvement of parliament and stakeholders, including civil society, in the accession process, was further enhanced. However, the inclusiveness, transparency and quality of law-making and effective oversight of the executive need to be further enhanced, and the use of urgent procedures limited. Constitutional reforms are needed for alignment with EU standards in some areas. There is scope for improved cooperation between the executive and independent regulatory institutions. Serbia is moderately prepared in the area of public administration reform. Good progress was achieved with the adoption of the public financial management reform programme, strategies on e-government and on regulatory reform and policy-making, and of new laws on administrative procedures, public salaries and local and provincial civil servants. Serbia needs to implement its reform targets, professionalise and depoliticise the administration and make recruitment and dismissal procedures more transparent, especially for senior management positions. The judicial system has reached some level of preparation. Some steps were taken to promote a merit-based recruitment system, and harmonise the jurisprudence. Further steps are needed to tackle political influence. The quality and efficiency of the judiciary and access to justice remain undermined by an uneven distribution of workload, a burdensome case backlog and the lack of a free legal aid system. Serbia has some level of preparation in preventing and fighting corruption. Corruption remains prevalent in many areas and continues to be a serious problem. The anti‑corruption effort has yet to yield meaningful results. The institutional setup is not yet functioning as a credible deterrent for corruptive practices. A track record of effective investigations, prosecutions and convictions in corruption cases is required, including at high level. Serbia has some level of preparation in the fight against organised crime. Some progress has been made in adopting a new police law, reorganising the Ministry of the Interior and in adopting the first serious and organised crime threat assessment (SOCTA) using Europol methodology. A credible track record in the fight against organised crime still needs to be established. The legal and institutional framework for the respect of fundamental rights is in place. Consistent implementation across the country needs to be ensured, including as regards protection of minorities. No progress was made to improve conditions for the full exercise of freedom of expression, where Serbia has achieved some level of preparation. Serbia was the first enlargement country to introduce the EU Index of Gender Equality. Further sustained efforts are needed to improve the situation of persons belonging to the most discriminated groups (Roma, lesbian, gay, bisexual, transgender and intersex persons, persons with disabilities, persons with HIV/AIDS and other socially vulnerable groups). Serbia participated constructively in regional initiatives and worked to improve its bilateral relations in a spirit of reconciliation, good neighbourly relations and establish a climate conducive to addressing open bilateral issues and the legacies of the past. The signature in June of a joint declaration with Croatia tackling certain bilateral issues was a positive development. Such an approach is key for reconciliation, peace and cooperation in the region, and should be pursued consistently. Regarding the normalisation of relations with Kosovo, Serbia remained committed to the implementation of the agreements reached in the EU-facilitated dialogue. Progress was limited, also due to the electoral process in Serbia and the domestic situation in Kosovo. However, momentum was regained in August 2016 with the start of the work on the Mitrovica bridge and freedom of movement. Continued efforts are needed to implement the agreements already reached with Kosovo. The steps taken should have a positive and concrete impact on the everyday life of citizens in both Serbia and Kosovo. Serbia continued to be affected by the migration crisis. This created a substantial burden on its asylum and migration system. Serbia continued to be constructive in its approach and to cooperate with neighbouring countries and Member States, ensured the effective screening of refugees and migrants, and made substantial efforts to provide shelter and humanitarian supplies, with EU support as well as the support of others. It is important that Serbia remains engaged. Serbia should also maintain its efforts to decrease the number of unfounded asylum applications lodged by its nationals in EU Member States. Serbia is moderately prepared in developing a functioning market economy. Good progress was made to address some of the policy weaknesses, in particular with regard to the budget deficit and restructuring of publicly-owned enterprises. Economic reforms have brought clear results in terms of growth prospects and reduction of domestic and external imbalances. In view of the still high level of government debt, fiscal consolidation needs to be sustained. The restructuring of large state-owned utilities is still to be completed. Credit activity is recovering but the high level of non-performing loans remains an issue. Unemployment remains high, particularly among youth. Further expansion of the private sector is hampered by weaknesses in the rule of law. Serbia is moderately prepared to cope with competitive pressure and market forces within the Union. Public and private investments increased, though the level of investment activity remains below the economy’s needs. The quality, equality and relevance of education and training do not match societal needs. Some progress was made concerning support to SMEs and entrepreneurship but SMEs face a number of challenges, including an unpredictable business environment, a high level of para-fiscal charges, and difficult and costly access to finance. 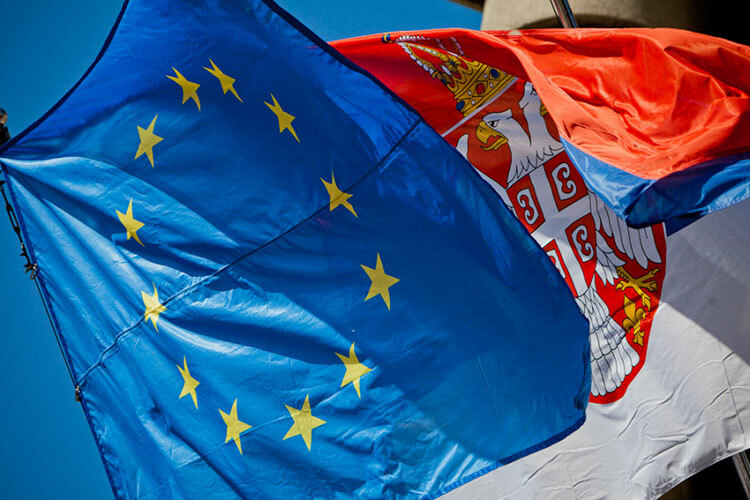 As regards its ability to assume the obligations of membership, Serbia has continued to align its legislation with the EU acquis across the board. Adequate financial and human resources and sound strategic frameworks will be crucial to maintaining the pace of reforms. Serbia has a good level of preparation in areas such as company law, intellectual property, science and research, education and culture and customs. Serbia needs to further improve investment planning and prioritisation of strategically important and mature infrastructure projects through its Single Project Pipeline and National Investment Committee, notably on energy and transport. In the areas of public procurement, statistics, monetary policy or financial control, Serbia is moderately prepared. Serbia will need to align its foreign and security policy progressively with the European Union’s common foreign and security policy in the period up to accession. Serbia needs to address, as a matter of priority, issues of non-compliance with the Stabilisation and Association Agreement, in particular on safeguard measures on some agricultural products, state aid control, and fiscal discrimination. September 2013: The SAA enters into force; the analytical examination of the acquis (“screening”) starts. December 2013: The Council adopts the negotiating framework. 21 January 2014: First inter-governmental conference on accession negotiations with Serbia. July 2016: ‘Rule of Law’ chapters 23 and 24 are opened.